Only a few students can say that they have been accepted into every Ivy League school in the United States: Harvard, Yale, Brown, Columbia, the University of Pennsylvania, Dartmouth, Princeton and Cornell. Among those who can call themselves members of this exclusive club are Augusta Uwamanzu-Nna and Kelly Hyles. They received acceptance letters last year from all eight of the Ivy League schools. Harold Ekeh did so the year before last. This year, Ifeoma White-Thorpe and Martin Altenburg were accepted into all of the Ivy Leagues. In 2014, Kwasi Enin made it to the elite eight, and he now attends Yale, which has an admissions rate of about 6%. 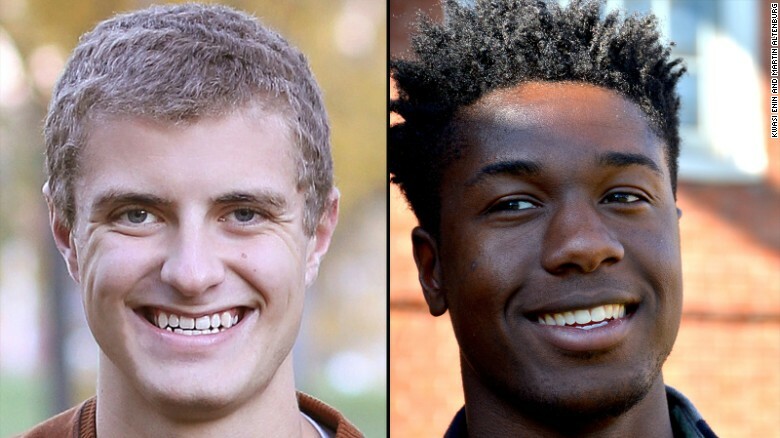 Students like Martin, 18, and Kwasi, 20, are often celebrated for their successes. Yet the spotlight is seldom turned on their parents — the adults who raised them. CNN reached out to all of the aforementioned students who were accepted into every Ivy League school, and Martin and Kwasi’s families agreed to be interviewed. Kwasi, who is from Shirley, New York, described a jovial childhood with high expectations. “More or less, I have African ‘tiger parents,’ ” he said. Martin, who lives in Fargo, North Dakota, described his parents as more hands-off. “They let me be a free spirit,” he said. Here’s a look at how two different parenting styles, in two different states, led to Martin and Kwasi being accepted into all eight schools. Kwasi’s parents, Ebenezer Enin and Doreen Enin, immigrated to the United States from Ghana in their late 20s. They raised Kwasi and his sister, Adwoa, to always value education, he said. Adwoa is now 17 and awaiting her own college acceptance letters. “Looking at their perspective, in Ghana, for example, only the richest people can go to college because they’re the only ones who can pay for it, because loans don’t exist. Everybody would want to go, if able. In America, there’s always a way to make it happen, provided there’s some financial support and stability,” Kwasi said. Ebenezer said he would not tolerate any grades on Kwasi’s report cards lower than a 95%, and that was because he knew that such grades — even though they were good — were not the best his son could achieve. “I would say a 95 to 100, that should be your goal, that should be your score in any class that you’re taking. Stay very focused, and you can do it,” said Ebenezer, who is a registered nurse. His wife, Doreen, is a nurse assistant. “People think my opinion is crazy, but look, it can be done,” Ebenezer said. Meanwhile, Martin in North Dakota said that his parents rarely checked his grades. “My parents, they’re the reasons I got into all of these colleges, but not in the way that a lot of people would assume,” Martin said. Kris Altenburg, Martin’s mother, said that since Martin’s interests were productive — he enjoyed science and playing his violin — her husband, Kent, and she gave him a lot of independence. “I just think, if they’re doing something positive, just kind of sit back and let kids do what they need to do,” said Kris, who is a licensed practical nurse. Kent is a fundraiser for a PBS affiliate in Fargo and works for the Fargo stage union. Kris said that she applies similar principles while raising Martin’s two younger sisters, who are 11 and 13. “I just want them to be happy,” she said. When Martin was a young boy, he would sit in his family’s basement in Fargo and read old math books. With his big blue eyes scanning the words on the page, he would dream of using mathematical equations to chase down tornadoes and other extreme weather events. At that age, if you asked Martin what he wanted to be when he grew up, he would say without hesitation: a meteorologist. “When I was younger, I had the seven-day forecast memorized,” said Martin, whose childhood aspiration to chase storms hasn’t faded away. He said he still has an interest in atmospheric science. “If I’m able to get a degree in physics or climate science, I’ll be able to pursue that career path after I graduate,” Martin said. He has not decided which school he will attend this fall. Outside of academics, Martin has an interest in running, swimming and the environment. Growing up in North Dakota, where the oil industry has a strong presence and oil production has helped propel the economy, Martin said that he thinks his environmentalism helped him stand out among other Ivy League applicants. Some 1,500 miles away in Shirley, New York, Kwasi Enin also had aspirations to change his community — and the medical field. “Somewhere between kindergarten and second grade, I was asked the typical ‘What do you want to be when you grow up?’ and I just said, ‘A doctor,’ ” Kwasi recalled. As a child, Kwasi was quick to smile, had a big heart for those in need and developed a love for music. He said that next year, he will be singing with the Yale Whiffenpoofs, the world’s oldest collegiate a cappella group. In high school, Kwasi sang in his church’s choir, played the viola and volunteered at a local hospital in his hometown, about an hour and a half outside New York City. Now, he continues to volunteer at medical centers in New Haven, Connecticut, and conducts independent biology research. He said high school is when students should not only pinpoint what career fields they’re interested in but pursue extracurricular activities in those fields. For himself, Martin and others, Kwasi said that he thinks straight As and high standardized test scores were not the only factors that helped them get accepted into all eight Ivy League schools. They also volunteered and not just participated in but held leadership positions in extracurricular activities, he said. “These schools are really interested in people who help their community, and I think all of those factors, put together, influence why we fit well into the mold of each of these schools,” said Kwasi, who also works as a college admissions consultant for the SAT and ACT test preparation company Prep Expert. Martin and Kwasi aren’t the only ones who have something in common. Their parents have some commonalities — three, to be exact. Similarly, when Martin’s family realized that he had been accepted into all of the Ivy Leagues, his parents asked how much of a dent the schools would leave in their wallets. “A lot of times my first question is, ‘How much does it cost?’ ” said Martin’s mother, Kris. Both families, who describe themselves as middle class, said they have been awarded financial aid and scholarship packages, which make some Ivy League schools more affordable than a state college. Second, both pairs of parents want the world to know that their sons are not nerds. Kwasi’s father had the same sentiment. Third, both parents were not surprised to see the wave of Ivy League school acceptance letters bearing their child’s name. “I had an inkling that something like that could be possible,” said Kris Altenburg. Kwasi’s family felt the same way, he said, adding that they expected him to excel academically. It turns out that parents and their parenting practices can influence children’s academic success, said Nancy Hill, a developmental psychologist and professor at the Harvard Graduate School of Education. ” ‘Hands-off’ parenting can work quite well when students are doing well and have strong positive relationships with teachers and other adults at school. For students who are not well-connected and well-supported by adults at school, ‘hands-off’ parenting can leave youth feeling marginalized and disconnected from their schoolwork,” Hill said. How much time parents spend with their children can also influence their academic success, according to a report released Wednesday by the Organisation for Economic Co-operation and Development’s Programme for International Student Assessment in France. The report involved a survey of about 540,000 students, about 15 years old, across 72 questions. Among the students who completed the survey, those whose parents reported “spending time just talking to my child” were two-thirds of a school year ahead of their peers in science learning; even after accounting for socioeconomic status, the advantage remained at one-third of a school year. For all parents, Hill said that focusing on developing your child’s love for learning and helping them find their passion and purpose can be beneficial. “In our research with adolescents, we find that parenting practices that include helping youth link their education to future goals, looking for ways to increase students opportunities for autonomy, are positively related to achievement, in part because it helps students see the value and meaning of schoolwork,” Hill said. Kwasi and Martin seem to agree. Martin said students should apply to their dream schools, even if they fear they won’t get accepted. “Still apply,” he said. “If you’re able to get into these colleges, you’re probably going to be able to succeed in this environment, and you’re going to succeed in whatever college environment you put yourself into, whether it’s community college or state college or Ivy League college.